See our WORKSHOPS page to see what other courses are being offered and to buy tickets! 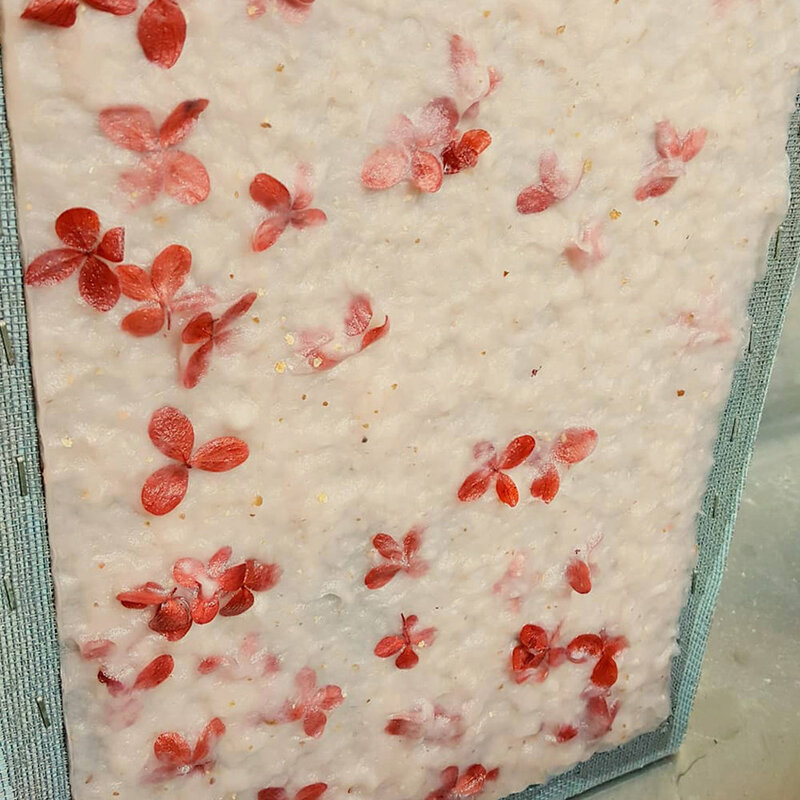 Learn the basics of hand papermaking! Artist & Entrepreneur, Janna Willoughby-Lohr, will lead a hands-on demonstration where participants will learn to form sheets of handmade paper. Craft your own hard cover journal in the case-bound codex style with a hard spine. LMPHM at WNYBAC Friday Night! POP-UP SHOP AT ALLEN ST. DRESS SHOP! Papercraft Miracles will be doing a POP UP shop at the Allen Street Dress Shop for FIRST FRIDAY in Allentown! Come down to Allentown to check out all the art openings and events and then stop over to the Allen St. Dress Shop at 89 Allen St., Buffalo, NY 14202 to enjoy FREE WINE and to get your holiday shopping done! Come see us and shop local! Join us for our 6th Annual Buffalo BookFest, as we welcome the 3rd Annual Upstate Wayzgoose, a gathering of printers, book artists, and lovers of the craft! WNYBAC's Buffalo BookFest is a day-long festival dedicated to printing and the book arts, with free hands-on demos all day, for all ages. A drop-in group work hour for bookbinders & crafters, held once a month! Papercraft Miracles is extremely excited to be among the artists selected to participate in the 100 American Craftsmen show again this year at the Kenan Center in Lockport, NY. We will have a much larger space than typical book shows and are looking forward to spreading out all the new pieces created just for this show! Be the first to see them in person! SAVE $1 ON ADMISSION WITH THIS COUPON! 100 American Craftsmen is an annual juried show of contemporary craft art held at the Kenan Arena on the historic Kenan Center campus in Lockport, New York--just a short drive from Buffalo, Niagara Falls, Rochester and southern Ontario. The show is noted as one of the top favorite craft shows/festivals in New York State, and Buffalo Niagara's only, and longest-running, show dedicated to contemporary craft art featuring leather, glass, metal, clay, wood, basketry, fiber, paper and mixed media. All proceeds from admissions and exhibitors fees are used to cover show expenses and support our 25-acre campus which is the largest regional community arts, education and recreation center in Eastern Niagara. This year's show will feature more than 30 new artisans along with eight Master Craftsmen. 10:30 AM-12:30 PM Music: Mike Caputi & Co. Learn the basics of making fantastic shimmery paper flowers and create gorgeous made-to-last paper flowers for your home. Open Studio will help novice binders develop the skills and confidence to work independently, and also be a support system for more experienced binders. Get advice and tips while working on your own projects. These books have a unique binding that allows them to be strong (like a case-bound book) but to also lay flat (like a coptic-bound book). They are durable and beautiful, albeit a little tricky to make. Once completed, it's difficult to see how they are constructed which adds to the "secret" part of their name. Everything you need to know to start making your own books! Includes your own tool set to take home! UPDATE! SPECIAL BOGO! Now, register two people for $25! 2 for $20 for Members! Papercraft Miracles will be participating in Buffalo BookFest again this year. A fun summer-time event with free workshops, demos and lots of great local vendors! Make your very own "bouquet" of wildflower and perennial seed bombs at this hands-on workshop for all ages. Come learn to make a tiny upcycled handmade book at this quick little workshop! Each book will be made from recycled scraps from other projects so you can make a book and help the earth at the same time! We'll create a pocket-sized origami & hardcover book perfect for poetry, tiny photos, and much more! 100 American Craftsmen is an annual juried show of contemporary craft art held at the Kenan Arena on the historic Kenan Center campus in Lockport, New York--just a short drive from Buffalo, Niagara Falls, Rochester and southern Ontario. Papercraft Miracles is extremely excited to be among the distinguished artists selected to participate in this great show. Papercraft Miracles will be doing bookbinding demos and free workshops throughout the day! Create a pocket-sized origami & hand-stitched book perfect for tiny poetry, photos, and much more! All levels are welcome, especially beginners. Pre-payment is required for all workshops at WNYBAC. You can pay online, by phone, or by mail. If you would like to send a check, please email info@wnybookarts.org to let us know. If you would like to pay over the phone, please call 716-348-1430. To enroll in this workshop, click here and scroll down or email or call WNYBAC directly. For more info about WNYBAC or to become a member, click here! Papercraft Miracles eagerly awaits this event ALL YEAR LONG! One of our very favorite places to be a vendor, The Buffalo Small Press Book Fair is not to be missed! Sales and specials will be in effect and unique Mother's Day gifts will be available! The 2016 event will take place on Saturday, April 9th from noon to 6pm AND Sunday April 10th from 11am-5pm at the Karpeles Manuscript Library Museum, Porter Hall, 453 Porter Avenue, Buffalo, NY. Remember this event is FREE and open to the public! For more info about the fair and its organizers, click here! Tuesday, March 22nd, the arts will be highlighted at GCC, presented by the GCC Fine and Performing Arts Committee. Join us in the William W. Stuart Forum for numerous workshops demonstrating creative endeavors such as drawing, painting, origami, bookbinding, printmaking, weaving and much more including a carnival style photo booth! Papercraft Miracles will be returning for the 4th year, doing bookbinding demos and mini-workshops throughout the day! Free! Available to GCC students and the community. Presentation about taking a break from work. Open mic themed is Mental Health Concerns at Work. On the back of the seats are answers about mental health from various women. Their answers are beautifully diverse. A selection of Papercraft Miracles products will be available for sale. Find this event on Facebook and at the Buffalo State Writer's Network Women's History Month Blog! To learn more about the Western New York Book Arts Center (WNYBAC) click here!